Prerequisite for enjoying Middle-earth: Shadow of Mordor: appreciation for a well-crafted action game. A distant second requirement is a basic awareness of J.R.R. Tolkien's Lord of the Rings fantasy world. I'm not talking Tom Bombadil slash fiction. I mean, you know that there are some rings and something-something one rules them all, right? Awesome! You're good to go. You don't have to like Tolkien's Middle-earth to appreciate this game, but there's plenty of lore trinkets in there for the initiated. Taking place in the timeline between The Hobbit and The Fellowship of the Ring, Shadow of Mordor has the player fighting back against the Dark Lord Sauron's Black Captains as Talion, a Gondorian Ranger ritually sacrificed, resurrected and now possessed by an unknown force to change Mordor for the better. This spiritual force is Talion's dark passenger, guiding him through the harsh realities of taking on Sauron's forces. Within the first ten minutes, it's clear that this isn't a family-friendly PG-13 experience. Shadow of Mordor is darker than any of the movies or licensed games based on Middle-earth that have come before. It also introduces one of the freshest game mechanics in years with the Nemesis System, a tug of war for power among the game's Uruk (Orc) captains and warchiefs. Shadow of Mordor begins by dropping Talion into Mordor with very little explanation of game mechanics. There are some basic prompts, but no long tutorials or hand-holding. Just go and figure it out, with missions slowly filling in the gaps. It can feel incredibly overwhelming at first, but it all clicks quickly. Talion's combat and upgrades are based on the rhythmic fighting exemplified by the Batman Arkham series, with the collect-a-thon of your standard sandbox game. The game's world is free for you to explore and easy to traverse utilizing fast-travel towers or, for shorter distances, a spirit arrow that'll transport the player to a creature within range. There's also a spirit run that'll make Talion dash across fields and leap over obstacles. For those who haven't experienced an action game with a rhythmic fighting style, combat is handled using a series of chained moves to attack, parry, roll away and execute special attacks to give Talion some breathing room from the Uruk who will attack en masse. 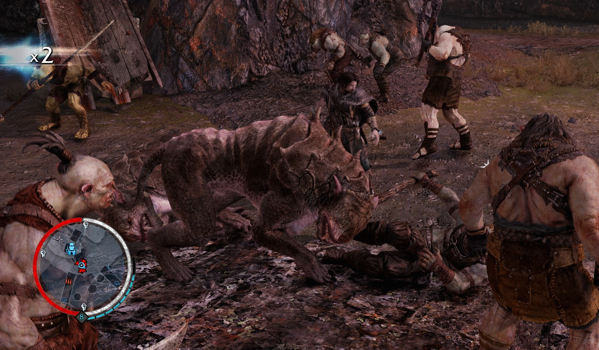 Some Uruk can't be attacked directly and will need to be leapt over and hit from behind; others will keep their distance using arrows and must be dispatched in the heat of battle with Talion's throwing daggers. There will often be an informant-type Uruk within a group you'll need to avoid killing so he's the last one standing, allowing Talion to interrogate him for information on captains and warchiefs. The action is fluid and intense, with a solid progression of power, where the odds are stacked against you facing three Uruk early in the game, but eventually you'll take on dozens at a time through instant executions and area of effect powers. Skills unlock by taking on story missions, which introduce fun new characters with their own mini story arcs. Talion can also take on a series of weapon-based challenges to upgrade his sword, bow and dagger. In addition, there are plenty of trinkets to find that fill in more details of the game's setting. Collecting these items isn't required to finish the game, but with full voice work and vignettes for each item, they provide plenty of color and weave in with characters you'll meet. For example, you'll find a carving that depicts a hunt, which will provide dwarven levity and passively introduce a character you'll meet later in the game. Many of the game's collectibles are hidden in the wraith world of Talion's dark passenger, which Talion can enter at any time to see through objects and get a sense of creatures in the area (highlighting the aforementioned informants, for instance). The game would be strong on the merits of its combat system alone, but what really makes Shadow of Mordor stand apart from similar action games is the Nemesis System. Each Uruk captain and warchief has a different look, name and personality. Each also has a variety of weaknesses and strengths, which may allow you to finish them quickly or may very well embolden them. Some are immune to stealth attacks, while others may become enraged if you blow up a grog tank near them. I never came across two Uruk that introduced themselves in a similar way. A majority will threaten, others will giggle, some will even rhyme! Once you've met an Uruk on the battlefield, they remember it. Did they barely escape the edge of your blade during the last encounter, when they ran away in terror because you brought a caragor (giant cat-like mounts with teeth)? They remember that ,too! Not only do the Uruk fight you, but they fight each other for dominance in the regional army. They'll engage each other in ambushes, duels and executions to increase their power, which will grant them more resistance attributes against Talion's stealth or use of mounted beasts against them. The Uruk can also increase their power through beast hunts, feasts and recruitment missions, in which Talion can intervene. All of these events, which are indicated on the world map, can play out in a variety of ways. Maybe you want to help build up a particular Uruk captain who you've learned is susceptible to ranged attacks. You can help this captain through a variety of challenges, building up Talion's XP along the way, for a showdown against a particularly challenging warchief. Then, as soon as this Uruk you've taken under your wing defeats the warchief and becomes the new leader, you pop an arrow through his head for an easy warchief kill of your own. The tactical lesson is that instead of banging your head on the wall time and time again to take out a warchief you just can't seem to finish, it's possible to set events in motion to replace him from a pool of captains who can be dispatched with ease. By strategically pitting Talion's enemies against one another, you not only make your own job easier, but you grow more powerful in the process. It's brilliant. These power struggles don't just occur in encapsulated mission settings, either. It's possible to run into one of these captains while just roaming out in the world. Get into a fight and other captains may show up and join in. If Talion falls to one of the captain's minions, that minion will be promoted to a captain himself (wardrobe change and all). Unlike most games, where being killed by a random minion is generally meaningless, Shadow of Mordor creates a relationship between the player and this once meaningless peon, who has now become a target for revenge, effectively transforming death from punishment to motivation. Early in Shadow of Mordor, the focus is to use information acquired from captains and informants to kill warchiefs, but eventually the game shifts to being about possession and betrayal. As Talion commands Uruks to betray their masters, he can fill the ranks of the army with his own minions. Now you aren't just mowing down the enemy, but making value decisions on the Uruk captains (and their minions) who will fight by your side. The enemy is now yours to command, bringing with them all their strengths and weaknesses. It's rare that an action game asks us whether an enemy is worth more dead or alive – let alone gives us the choice – and in Shadow of Mordor it's often the latter. Although the story makes it clear that Talion is "banished from death," the Uruk forces are relentless, and you will die many, many times in terms of pure gameplay. In the time between resurrections, it's possible to observe all the changes in the Uruk army that occurred during Talion's hiatus from the world. New captains will join the ranks, while power struggles may see some Uruk dispatched by their own kind. Several are sure to grow in power from hunts and duels. The power shifts may very well cause you to pivot your strategy, as a prior target may now be too powerful to take on directly. This could be frustrating if there weren't nearly a couple dozen other targets at any given time. For everything Shadow of Mordor gets right in its combat and story, however, with a top-notch voice cast and overall execution, the "boss fights" directly against the Black Captains may not sit well with some. The first one, against The Hammer, is your standard fare with extra minions added into the fight, but the other two I hesitate to even call battles, although the lead-ins are some of the coolest fights in the game. Shadow of Mordor is so great overall that those expecting climactic boss fights may be disappointed, as you'll come across more interesting scenarios just exploring the world and challenging the other, garden variety captains. Middle-earth: Shadow of Mordor is a well-paced sandbox game with a revolutionary new game mechanic in the Nemesis System, which I imagine we'll see iterated on in the years to come. The Nemesis System creates the opportunity for two players to have wildly different experiences fighting the Uruk-hai, while Talion collects trinkets and upgrades. Your nemesis (an Uruk who will find a way to kill you time and time again) will be completely different from your friend's, and you'll have plenty of unique experiences to share about different tactics you used to take out a certain warchief. Or, how you were chasing a captain who retreated in battle and ran right into the jaws of a wild caragor, robbing you of sweet victory. What would have otherwise been a competent sandbox game with solid combat mechanics and an interesting twist on a known fantasy world is elevated by the Nemesis System. 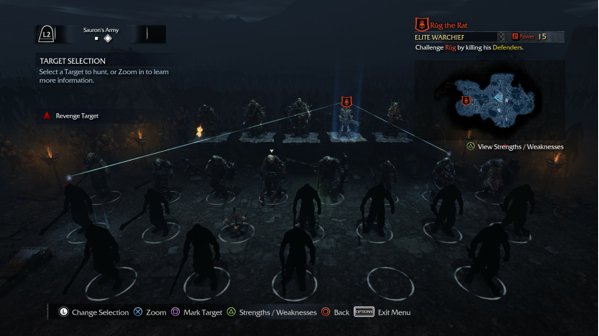 Shadow of Mordor is the strategic person's action game. This review is based on a PlayStation 4 retail copy of Middle-earth: Shaodw of Mordor, provided by Warner Bros. Middle-earth: Shadow of Mordor is developed by Monolith. Images: WBIE.